If you follow me on Instagram, you may have seen that I was having my en suite re-done. I’m super lucky to have my own bathroom and even luckier that my parents let me have (mostly) free rein with redesigning it. Its a relatively small space, so I was limited with what I could do but I definitely think I’ve made it work. Sooo, heres to some new bathroom vibes. I’m aware this isn’t the most pinterest worthy bathroom in the world, but I tried my best okay haha! I decided to go with white metro tiles, because I just love the way they look and I think they’re pretty timeless in terms of design. I kept the same shower as I had previously, as there wasn’t much wrong with it, so no point splashing cash where its not needed. However, I did pick up this metal basket thing (?!) from Ikea thats perfect for holding everything I need in the shower. 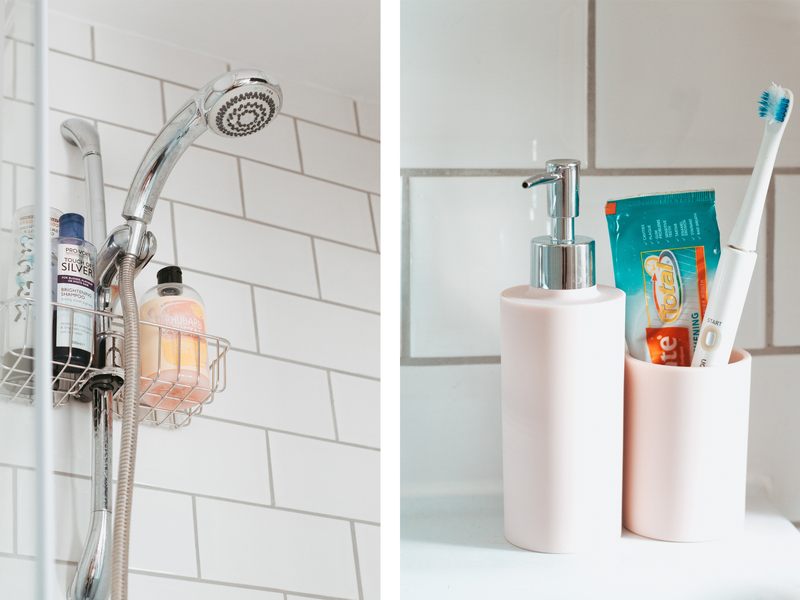 Also, since its in the photo, I just wanna say how good the Superdrug Rhubarb and Custard bath and shower soak is, it smells divine! Moving onto the sink area, I picked up this super cute soap dispenser and toothbrush holder combo. Because the room is quite monochrome, I wanted to add pops of colour here and there and I decided pink would probably look best. Well, mostly because pink is my favourite colour so I couldn’t resist. These were really cheap and I love the shade of pink, a good middle ground for sure. Above the sink area, instead of having a cabinet, I went for a circular mirror. 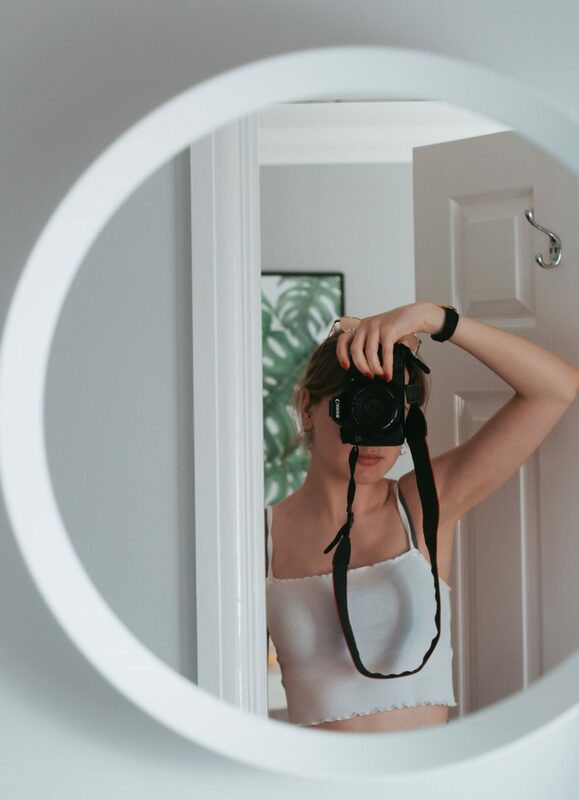 I don’t know what it is about round mirrors, I just think they look much more modern. 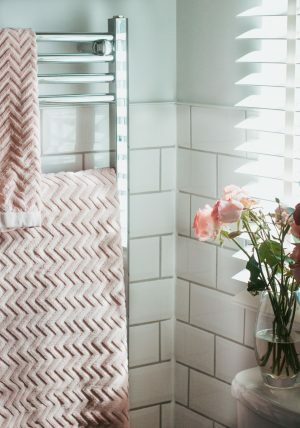 This one is from Ikea (of course) and was only £20 which is a right bargain.To add to the pink accents in the room, I picked up these towels, again from H&M. They don’t look very pink in the photo but thats the lighting for ya. They have this jacquard pattern, which I’m a big fan of as its a bit different, which is always nice. To finish off the room, I’ve popped some pink roses there but I’d love to get a plant of some sort, with a cute pot for it to sit in. I definitely think that’d make it look more static and complete the room. The flooring isn’t quite finished yet, but I’ve found some knock-off marble tiles that I’m going to have put down. How blogger of me, haa! Hopefully once the flooring is down, it’ll look 100% complete – yay!